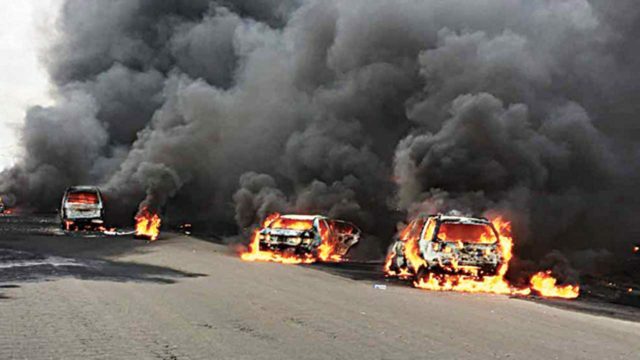 Days after the tanker explosion on Otedola Bridge, Ojodu Berger, along the Lagos-Ibadan Expressway that claimed nine lives and over 50 vehicles, victims and their relatives have begun to count their losses. A relative of one of the women, who narrowly escaped from the tanker explosion scene, said her younger sister is now incommunicado, because of the trauma. Her sister had escaped with one of her twins, Eyitoke, while the other twin, Eyitayo, is still missing. Mrs. Funmi Balogun said her younger sister had gone to pick the children, a boy and a girl, from their school in Ikeja GRA, and was only able to escape with the female of the set of twins, Eyitoke. She told The Guardian that because of the trauma, her younger sister was moved to their elder sister’s place in Magodo. Already, Balogun has posted the boy’s picture on her Facebook page and other social media platforms. Her posting reads: “This boy in this picture is a three-year-old named Eyitayo. He was involved in the unfortunate tanker accident with his mother, twin sister and the driver at Otedola Bridge yesterday (Thursday) evening. “They were a few cars away from the tanker when the explosion occurred. The driver (Mr. Joseph) carried Eyitayo while the mother escaped with Eyitoke (Eyitayo’s twin). “The whereabouts of Eyitayo and Mr. Joseph is still unknown as all attempts to trace them at the scene of the accident proved abortive. Balogun, however, declined to state if they had gone to the Emergency and Trauma Centre at the old tollgate to look for the duo. She also declined to say whether they had reported the case to the police so that the driver’s number could be tracked. She, however, stated that as at 3:00pm yesterday, they were yet to know anything about their whereabouts, because neither the driver nor the small boy was back home. However, many have called on the family to share the picture of the driver to aid easy identification. When The Guardian asked to be allowed to speak with the mother of the missing boy, Balogun said her sister was in Magodo and couldn’t be reached on her phone, as her car, a KIA model, including her phone, got burnt. “She does not have a phone for now except I get back to Magodo. Please do you have any information, because she is not talking to anybody? If she had to talk to you, I need to encourage her,” Balogun said. However, news that little Eyitayo had been found later went viral on social media last night, but attempts by The Guardian to reach out to Balogun to confirm the story was not successful as she did not respond to several call and text messages. The Lagos State governor, Mr Akinwunmi Ambode, in the evening of the incident, had visited the scene, which he described as sad and unfortunate. Commending all the emergency responders, who helped to curtail the spread of the fire, Ambode said though lives were lost to the unfortunate incident, he would take solace in the fact that more lives were saved. He admonished residents to always give access to emergency responders during such incidents. A resident of Lagos, Oluwaseyi John, who commended Ambode for visiting the scene early to commiserate with victims, called on the governor to reactivate the law that restricts movement of articulated vehicles to midnight. He also feels that until corporate organisations, which engage the services of these articulated vehicles and their owners are penalised, the avoidable accident will continue to occur. This is not the first time a tanker would explode claiming lives, most of the time, after the usually sympathetic messages and condolences, nothing is usually heard about the incidents including the culprits. In December 2017, about 21 vehicles and five motorcycles got burnt in a tanker explosion in FESTAC area of Lagos. Till date, there has not been any official statement of the accident in terms of bringing the culprit to book. About a week ago, three persons died in Ojuelegba, as a result of a truck spilling the consignment it was carrying from the Ojuelegba Bridge. Managing Partner, Ulomka Multi Solutions, a safety organisation, Ugochi Obidiegwu, speaking on what could have been done to prevent the accident, said before an accident happens, there is something called a chain of errors. “From one oversight, mistake, slip up, poor judgment to another. At each point something can be done to forestall the eventual accident and its effects. “To avert another accident we need structures, policies and systems to protect lives and properties. It is not enough to create them; we need proper follow up on compliance and penalties for failure to comply. A lot of times in Nigeria, compliance is relegated to the background. It shouldn’t be. According to her, when accidents like this happens, the first thing people should do is to exit the vicinity, since tankers carry flammable material so usually an explosion happens right after a collision under appropriate circumstances. “Therefore, people need to leave immediately to a safe distance. This is not the time to take pictures and do videos. I also understand that some people could go into shock, which makes them freeze. It is the duty of others around to speak assertively to them.